Are you wanting your gallery or album in a language that requires Right-to-left or RTL support? Envira Gallery makes enabling this a breeze with just the click of a button. We’ll show you how to enable the right-to-left support for your Envira galleries and albums! Will this work the same for albums? Ultimate, Agency, Pro, Plus or Basic Envira license. Learn how to purchase or upgrade to one of these licenses. Your next step is to navigate to the Misc tab and check the box for Enable RTL Support? Finally you’ll just need to click Publish or Update on your gallery to save the changes. And it’s that simple! 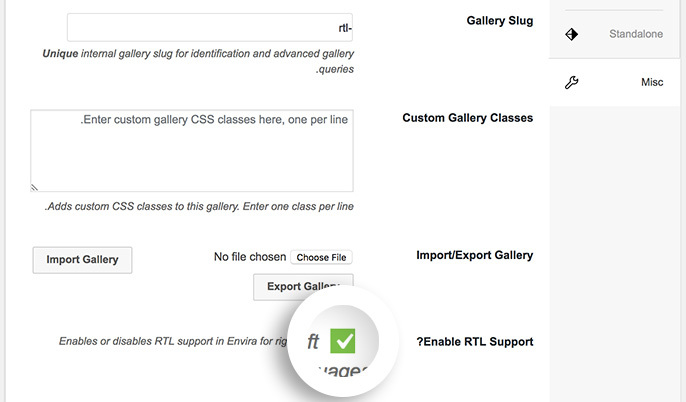 You’ve now enabled the Right-to-left support for your Envira gallery! Why not check out How to Import and Export Galleries. A: Absolutely! The Album’s Misc tab has the same option to Enable RTL Support?